Some time in 1908 some huge trees were cut and milled to form the timbers, huge beams, supports and flooring for the new First Baptist Church in downtown Jackson, TN. Some of those trees were easily 75-100 years old at that point. So a natural growth process that started probably after the Revolutionary War, but well before the Civil War, had prepared all the hydrocarbons inside tons of solid “heart” pine and many more tons of oak. This was what used to be called original growth forest and it produced very dense, very heavy timbers for building. The construction took 3 years. On the outside of the First Baptist Church, the columns, mortar, bricks and stone made the structure look like it could last forever. The outside structure was 12-18 inches of brick and an interior inner wall surrounding the sanctuary was brick and just as thick as well. But every other piece of the structure was wood. So although the exterior of the building gave the appearance of masonry and stone and permanence, the vast majority of the structure was from trees grown in an era when they were almost impervious to termites but were full of resin, strength and energy. 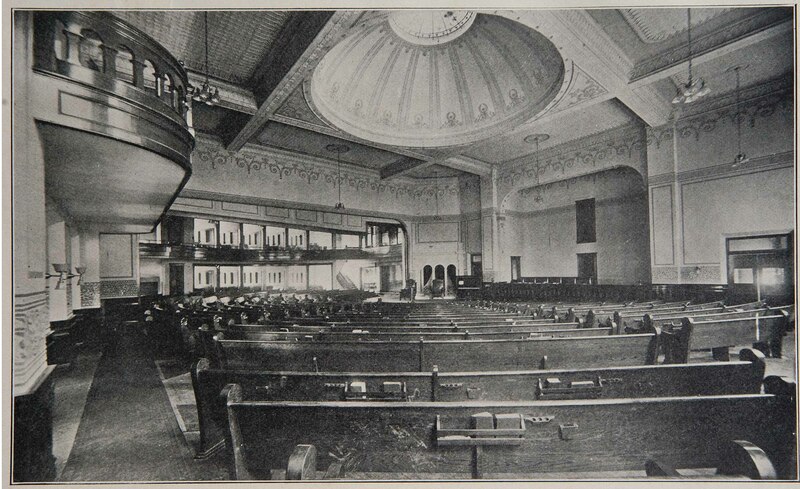 Some time later, to increase the capacity of the sanctuary, new balconies were added with structural steel inside, and the diagonal floor plan was changed to center the pulpit at the front of the organ wall. The pipes were concealed by a lattice work of oak framing a porous material that moved in and out with loud base notes when the organist pushed hard on the foot pedals. The balconies and all the oak took on a deep, rich amber color from layers of varnish, time and wax, and grew dark surrounded by age, passion and wisdom. You study a structure if you are forced to spend 3 days a week in it for 18 years. John Jennings and I would sit in our seats during services and draw the columns, doorways, windows and ceilings on the backsides of the church bulletins with pencils provided for visitors. There were oak panels carved with scallops that came to a point at the top. These were repeated across the balcony hundreds of times. The wooden floor sloped down from the back and sides toward the pulpit. Behind the choir a wall screen hid an impressive set of organ pipes and hoses stretching 3 floors up. This was supported by even more wood. The Sunday School class rooms were around the outside of the structure and extended onto the roof level of the sanctuary below. Windows during Sunday School provide a view of the cupola with a gold, round, roof. Later, John Jennings and I sat in Sunday School classes, eventually at the Senior High boys class, on the top floor above the sanctuary. James Walker, the County Commissioner of Education was our Sunday School teacher. One day John and I noticed that the roof, outside the window, was at waist level and extended outside over toward the gold dome. We nudged one of the panels in the walls below the window and pushed it open. A secret panel! We decided to come back during church services that day. When all the good people of the First Baptist Church had found their seats for the 11:00 AM Sunday Service, signaled by the sound of base notes from the organ and the first hymn, we made our move. We pushed the panel and entered a dark, attic-like space, crawling on our hands and knees. It was pretty dark, the sound of the pastor and singing could be heard in the distance so we crawled on, over wires and plaster-lathe disturbing an occasional pigeon. We were careful to crawl along the support beams. We made our way toward a dimly illuminated space in the distance. Finally we looked through the opening where the light was coming. We could see the congregation below, we had crawled almost to the top of the dome. We were 4 floors above the concentrically, arranged pews. Women wore hats. From that angle there were hats on heads everywhere. I suspect there was a silent prayer going on below, you could have heard a pin drop. We said nothing. Without a word, we began to crawl backwards on our knees, as quietly as we could. We found the door and before we shut it, we looked back. The entire area was a forest of huge beams, interlocking to support the plaster dome on the interior. At 11:15 on Friday morning as I watched the building burn with enormous intensity I thought of the church adventure that John Jennings and I shared. I thought about all those trees and all that timber and resin releasing energy stored up long before the Civil War. I also thought about my plans to shoot video of the Church’s interior spaces. I had called John E. Allen last Summer to do the shoot but we decided the Winter was better, the interior of the Church in summer was quite hot. I had hoped to shoot on this trip. It didn’t work out.